It’s not always about the magic tricks; it’s more often than not about creating an emotional link with your audience. After you show people this, you will find a lot of people realise how easy it is to actually make a magic elephant. They then want to pass on what they have learnt and show other people in their family or friends circle. If this happens, it’s a good indicator that they really liked it. Once they have made this time investment into your magic performance, you can then do more of your tricks for them and get a better response. Once you realise that a simple bit of towel folding such as this can garner the sort of responses you are looking for, you will begin to keep an eye out for things of a similar nature and you will realise their true value to magicians. You can start to mix and match these with your other magic tricks and start to create your routine out of them. What if your elephant was able to locate a chosen card somewhere? This would work well with a fun mentalism routine as elephants are known for their long memories. There are many possibilities and it should be fairly simple to incorporate into a magic plot. The magic elephant is great for any guys or girls who are looking for something to make a possible romantic interest go “ooh” and “aah”. They will love it. 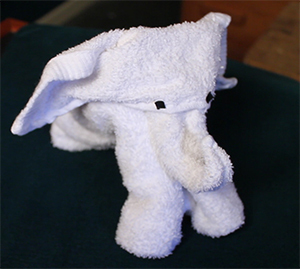 Did you enjoy this Towel Elephant? To learn more simple magic tricks Click here!